For the Indiana Pacers the month of March could not end soon enough. They went 4-10 during the month including all eight road games and have dropped from the No. 3 seed in the Eastern Conference to the No. 5. With the playoffs looming, they need to get back on track to risk being eliminated in the first round. Fans will be hoping the team can do just that Monday night when they face off with the Detroit Pistons, another team fighting to secure a better position in the playoffs. On a good note, at least the game will be played at home where the Pacers are 28-10 on the season. However, that didn’t seem to matter too much Saturday night when they took on the Orlando Magic. While it was a close game throughout, the Pacers, a team known for playing good defense this season, allowed the Magic to score 65 points in the second half. 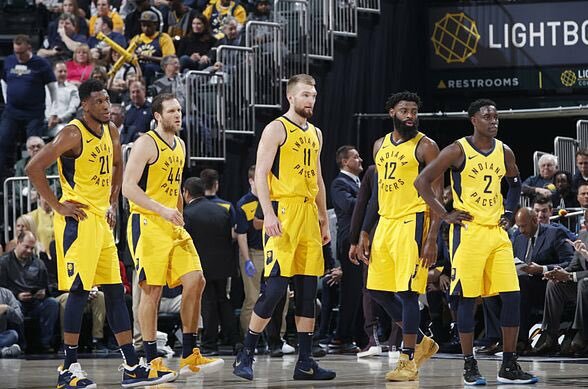 But while the month of March as a whole was disappointing for the Pacers, there was one shining moment, a 124-88 win over one of the best teams in the Western Conference, the Denver Nuggets. So, they can play great basketball; they just have to cut out all the mistakes and lapses. Detroit will be more than happy to pounce on a struggling Pacers team and keep them down for another game. But they may have to do so without their best player, Blake Griffin, on the court. He missed Saturday’s game due to some soreness in his left knee and it is not clear whether he will miss Monday night’s game against the Pacers, yet. Officially, he is listed as being day-to-day. The Pistons went on to score a season-low in the first half Saturday night against the Trail Blazers, 31 points. But then they rallied in the second half and went on to win, 99-90. With the win, the Pistons are 39-37 on the year and a half game ahead of the Brooklyn Nets for the No. 6 seed in the Eastern Conference (and a date with the Philadelphia 76ers in the first round). But it is not just their hold on the No. 6 seed that is tenuous at best. The Orlando Magic, who would be the de facto No. 9 seed, are only 1.5 games behind the Pistons. Detroit may be motivated but the Pacers are the better team—especially if the Pistons end up sitting Blake Griffin. So, take the Pacers to win (-278) over the Pistons (+230), straight up and against the spread (-6.5).